Cindy from SpringClean Cleanse here. I hope this email finds you well. I have been busy learning more about whole health beyond nutrition and have another website coming out soon called Wellness Faire. 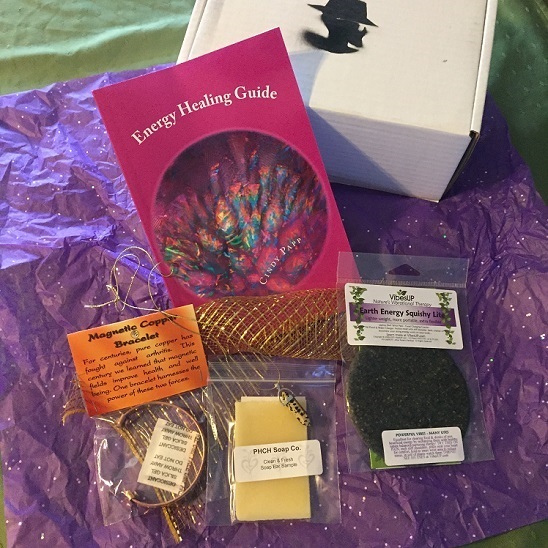 As a result, I have put together this gift box I call The Mystic Healer gift box. It is a collection of gifts/tools for energy and vibrational healing. I am offering the deal to my newsletter subscribers, first, due to limited supply. Separately, these items cost $75, but I am offering it now for only $30 plus shipping. Energy Healing Book - normally $7 - The go-to book on energy and vibrational healing and how it works. Learn about crystals, gems, Reiki and more as you explore how to use various tools and resources at your disposal to help nurture and heal while on your personal journey on Earth. The “Earth Energy Squishy” - normally $ 29 - Made of gemstones, herbs, and essential oils with a liquid crystal coating, these contain tiny gem spheres of clear quartz that work like natural little “good energy batteries” that can regenerate themselves. They work just like the sun to draw powerful energy to it. Try using these on painful areas, on chakras during meditation, or as a coaster to filter water! You'd be surprised at how versatile the uses of these miraculous squishies can be – check out VibesUp.com for more info. Copper Bracelet - normally $20 - Copper has been used for anemia, protection, arthritis, energy balancing or ailments such as immediate relief from nausea. While this information is controversial, a double-blind study in Australia concluded that copper bracelets reduced pain and inflammation. This beautiful bracelet has magnets on each end for added effectiveness as well as a unique and lovely design, sure to attract beautiful energy wherever you go. Gemstone - normally $15 - Each gemstone has a unique quality and gift to share. You can be sure your instincts will choose the box with the gemstone best suited for you. Each comes with a complementary gold wire for display, but you can use yours any way you desire. PCHC Natural Soap - normally $ 4 - Pure Hearts and Clean Hands soap these Natural Handmade Soaps are excellent for dry skin, eczema, psoriasis, or any other skin issues. Each box contains a different scent; citrus, cool, earthy, minty and more; allow your instincts to guide you into choosing the right box with the right scent for you and enjoy!